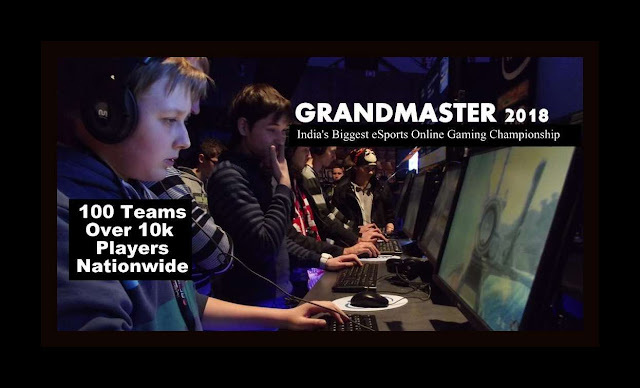 Home / Sports / Tech Makoda / India's Biggest Online Gaming eSports Championship "GrandMaster 2018"
India's Biggest Online Gaming eSports Championship "GrandMaster 2018"
India's biggest Online Gaming eSports Championship titled "Grandmaster 2018" featuring thousands of players and 100 teams will kick off on 1st April 2018, with the Grand Finals being held on 30th April. There will be a total of 100 teams - linked to 100 top cities in India. At least 10,000 youth are expected to participate in this event nationwide, claim the organisers, Trinity Online eSports India. At Grandmaster 2018, participants have to battle it out in the top four eSports games — FIFA, Counter Strike – Global Offensive (CS:GO), League of Legends (LOL) and Defense of the Ancients 2 (DotA 2). Gamers will be provided access to play one game every 3 days. Three out of the four games must be played with two teams of six players each. Participants who play FIFA can enrol as individual gamers. The grand finale will have teams with 8 players each, while semi finals and qualifying rounds will have 6 players each. The "Grandmaster 2018" registration gateway for the IndiaScribes.com Online Gaming Championship (ISOGC) will be open from 25th February 2018 and the entry fee for each player is Rs 100 for beginner level and Rs 250 for the intermediate level. Players can select either beginner or intermediate level. Very experienced players can directly apply for the third and final level which is the Master level, however entry for this level is subject to scrutiny and only 100 applicants will be selected for the Master level. The first 200 registrants get access to game for FIFA. 84 teams will play LOL. The IndiaScribes.com Online Gaming Championship (ISOGC) comes with a strict set of rules. If you win a match, all you have to do is provide the screenshot or picture of the result on a pre-determined Whats App No and it will be updated automatically. The Championship is supported by Mumbai-based Nevada Putman Foundation, social worker Rahul Singh, Raj Wadhwa of F B Diamonds and several other brands which will be announced later.